The team designed an online private banking platform for Credit Suisse‘s customers to manage their investments. It also informs clients of opportunities and suggestions the company are giving to improve their portfolios. This was part of an initiative to digitize private banking. I joined the team after the project has kicked off, and designed a part of the full experience. I was part of a team of UX designers and an art director. I was responsible for Investment Ideas, where clients can view suggestions by the bank that could ultimately improve their portfolio’s value. I worked on the content, visual design, and user experience for this segment of the app. We engaged the clients in co-design sessions to better understand their needs and expectations and hosted user testing sessions with their customers to get their client’s perspective. I used Sketch for visual design and Axure for prototyping. Unfamiliar with the finance industry, I had to do some personal research on investments and personal banking. Co-design sessions with the clients and customers helped me understand how the bank’s clients think and what their motivations are. Apart from user interviews, we used card sorting to identify the information that are essential for the bank’s customers to make decisions regarding products. 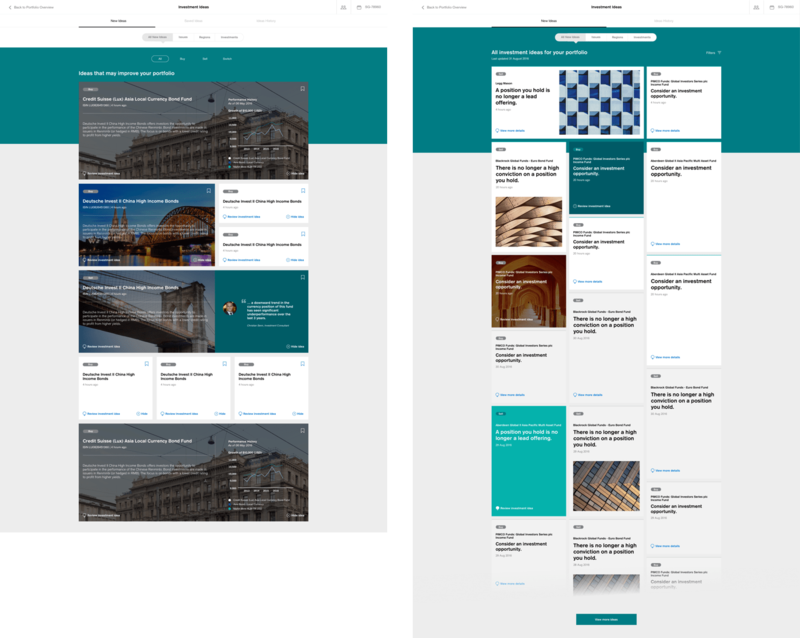 I went through a series of iterations on the visual design, adding and removing elements based on what’s most important for our users to see. Although there were a few compromises due to some technical limitations, the design still focused on important information first. The first few designs integrated more images to break the text in the page. However, these images were not helpful for users to achieve their goals and I had to make adjustments. Early headers hid critical information at first. This was changed based on our interviews and user testing. Cards have been adjusted to show the most relevant information for the client. 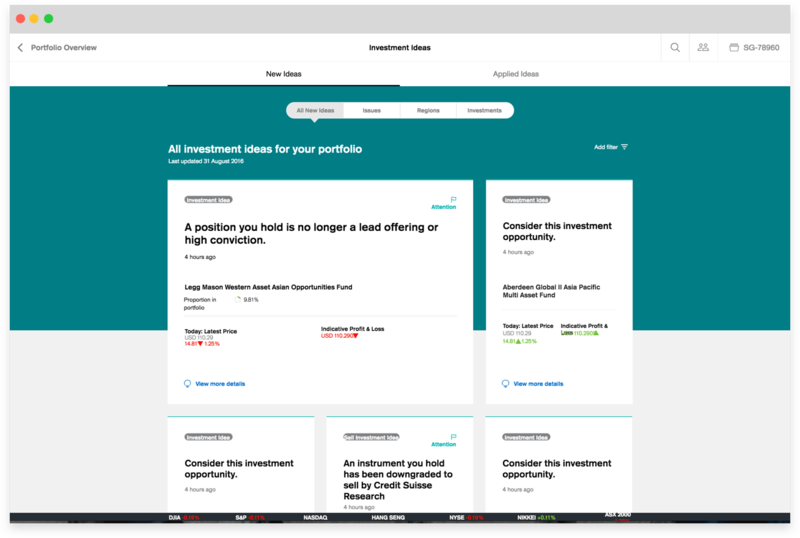 The design for the Ideas dashboard changed to accommodate critical information. 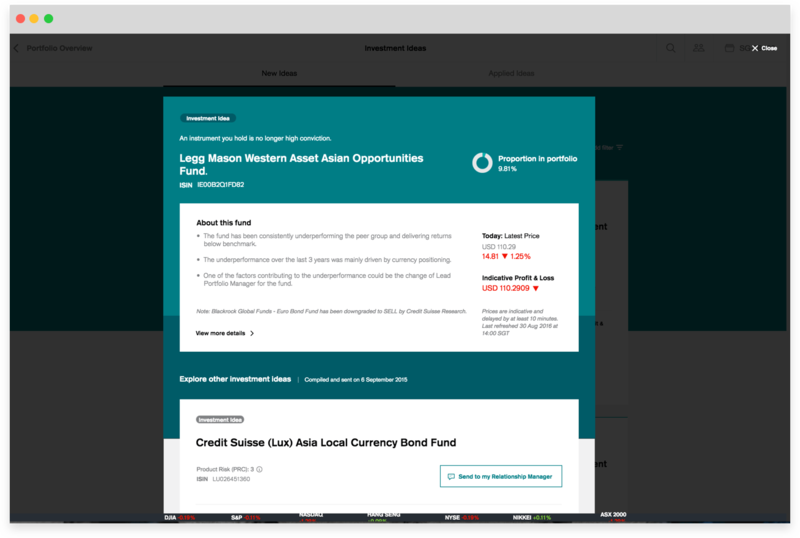 The platform was initially released for the bank’s Asian clients. The digital app was adopted by 40% of the client’s customers and helped them generate a billion dollars. It has also helped Credit Suisse win awards for their digital banking experience. As a team, we’ve successfully empowered our client’s customers to manage their investments at their convenience and bridge the communication between clients and relationship managers. Due to the results, I consider the project to be a huge success.